“Whenever you are confronted with an opponent. Conquer him with love". Dr. Ravindra Kumar is an eminent writer, thinker, scholar, political-scientist/historian, peace-worker and educationist having more than 100 works on great personalities of the Indian Sub-continent including Gautama Buddha and Mahatma Gandhi and on various social, religious, political, historical, educational and cultural issues to his credit. Some of his well-known works include Morality and Ethics in Public Life, Theory and Practice of Gandhian Non-Violence, Religion and World Peace, Non-violence and Its Philosophy, Five Thousand Years of Indian Culture, Mahatma Gandhi at the Close of Twentieth Century, Mahatma Gandhi in the Beginning of Twenty-First Century, Towards Buddha, Towards Peace, Five Thousand Years’ History of Jammu-Kashmir, Civilization: Its Fundamentals and Evolution, Gandhian Thoughts: New World, New Dimensions etc. Universally renowned Indologist and the Former Vice-Chancellor of the CCS University of Meerut, India, Dr. Ravindra Kumar has been associated with a number of national and international academic, cultural, educational, social and peace organizations and institutions. He has visited many countries of the world as a Visiting Professor and Scholar and has delivered more than 400 lectures around the world on subject related to Asian values, civilization, culture and history, cooperation, Gandhism, human rights, Indian way of life, international understanding, and world peace. He is the Editor-in-Chief of the Global Peace International Journal. Between 1993 and 2007, he has organized many national and international seminars at various places on Religion and Politics, Morality and Ethics, Education, Peace and Development, Non-Violence and Democracy, Hunan Rights, and Relevance of Mahatma Gandhi. 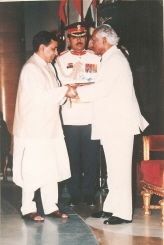 Besides, Shan-i-Kaum, Ambassador of Peace, Shantidoot, Sardar Patel National Award, Master of Wisdom and other honours, Padma Shri was awarded to Dr. Ravindra Kumar by H. E. the President of India for his noteworthy services.